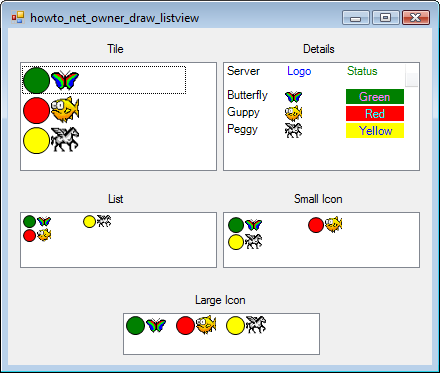 This example shows how to make an owner-drawn ListView control that draws server status information in Visual Basic .NET. Normally a ListView displays textual data but you can change that behavior to make it display anything you can draw. This example draws images and colored circles to show the status of its entries. The approach is to set the ListView's OwnerDraw property to True and then make items and subitems as placeholders in the control. Then code then catches the ListView's DrawColumnHeader, DrawItem, and DrawSubItem event handlers and draws the items appropriately. The only really non-obvious issue is that the DrawSubItem event handler that is called to draw the details view executes for every subitem in each row including the item itself. That means the DrawItem event handler should not draw the item because it will be taken care of by the DrawSubItem event handler. The basic ideas aren't too complicated but you do need to do a fair amount of drawing so this is a fairly long example. The program uses the following ServerStatus class to hold information about each server. This class holds a server's name, a picture representing the server, and a color indicating its status. When the program loads, it creates the ListView controls' data as shown in the following code.
' Make a server status item.
' Save the ServeStatus item in the Tag property.
' Add subitems so they can draw.
' Add the item to the ListView. The form's Load event handler calls AddItem to add items to the ListView controls. AddItem makes a ListViewItem object and adds it to a ListView. It sets the item's Tag property to a ServerStatus object so the program can late get information about each item. The following code shows the DrawColumnHeader event handler.
' Just draw the column's text. In this example, the DrawColumnHeader event handler is fairly simple. It just draws each column's text within the indicated bounds. It gets the text from the ListView's column text set at design time.
' Draw the item. In this case, the server's logo.
' Get the ListView item and the ServerStatus object.
' Draw a status indicator.
' See how much we must scale it.
' Scale and position the image.
' Draw the focus rectangle if appropriate. If this is the ListView's details view, the code simply exits because the details view is drawn by the DrawSubItem event handler. If this is not the details view, the code gets the item's corresponding ServerStatus object from the item's Tag property. Next the code clears the item's background.  It makes a Rectangle in the left of the area where the item should be drawn that is as wide as it is tall and draws a status indicator circle there. The code then calculates the scale at which it should draw the server's logo image to fit the available area nicely. It next draws the image to the right of the status circle. That's all the code needed to draw the item unless the ListView is displaying the detail view. The following DrawSubItem event handler produces all of the graphics for the detail view.
' Draw subitems for Detail view.
' Draw the server's name.
' Draw the server's logo.
' Draw the server's status.